How perfect to have my yarn housed in Beannacht Books, kitty-corner to LYS, while the shop is under construction. I had forgotten that my first love affair with yarn began while I was working in Chapter and Verse in Bristol, England. 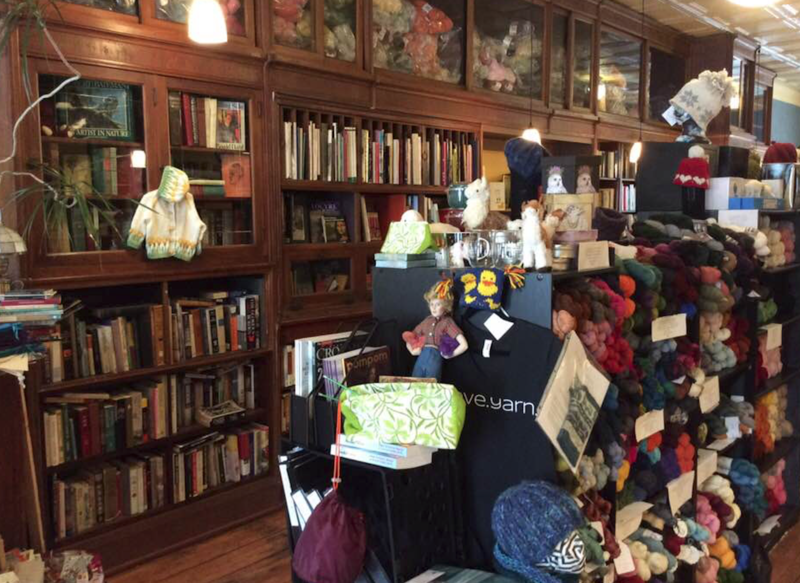 It was an academic book store, so in the summer, my colleagues taught me how to knit sweaters (I didn’t make hats, scarves, or mittens until many years later). There was a to-die-for yarn store right across the street and that is where I bought my Rowan Yarn and Kaffe Fasset patterns. Those were the days of drop shoulders and oversized sweaters…the eighties. I have made a laptop case from fulling one unfinished Kaffe Fasset sweater. I still have the turquoise Lopi sweater (very popular color at that time!) and haul it out on appropriate wintry days. I regret donating two sweaters to a local second-hand shop, not because of the yarn, but the cool buttons I had used. I still have the fair-isle vest I knit for my father, fulled and fitted for me now that he has passed away. 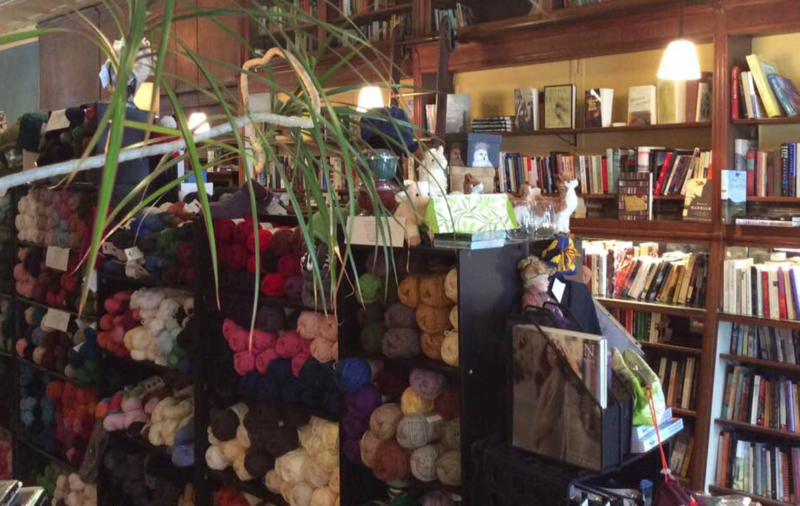 All these fond memories of the book store and my colleagues and the pubs are flooding back as I sit here with a view of yarn and books. Come join me in the cozy sitting area. 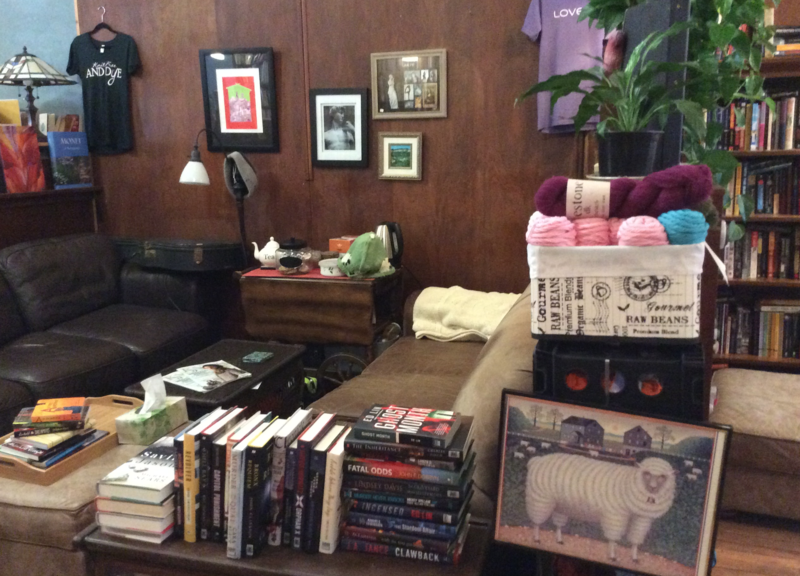 My shop hours are the same: 10-5 Tuesday through Saturday and I’m selling both yarn and books! Cozy couches at Beannacht Books. View from the front desk. That’s what I said when I looked through the new Interweave Knits. The cardigan by Sarah Solomon on the cover is so beautifully designed for me: long, loose, with cables and pockets, I wanted to cry, knowing how long it would take to knit it. Then there are these fabulous men’s cardigans and sweaters on gorgeous models and the tears started welling. Why can’t I just knit all day? This collection poses some interesting combinations—a linen stitch, zippered motorcycle-style jacket, a cable and fair isle sweater, a drop-shouldered sweater with a long sculptural hem, a truly elegant poncho. Even if you never knit one of these patterns, you’ll enjoy suffering and sighing as you linger over collection. Gently mix ingredients under a wool blanket. Serve with a cup of tea or glass of wine and soothing music. Optional add on: feathered, furred, or other companion. Most effective with repeated use. Saturday, December 2nd, is Christmas in Bethlehem, an annual kick-off for the holiday season. 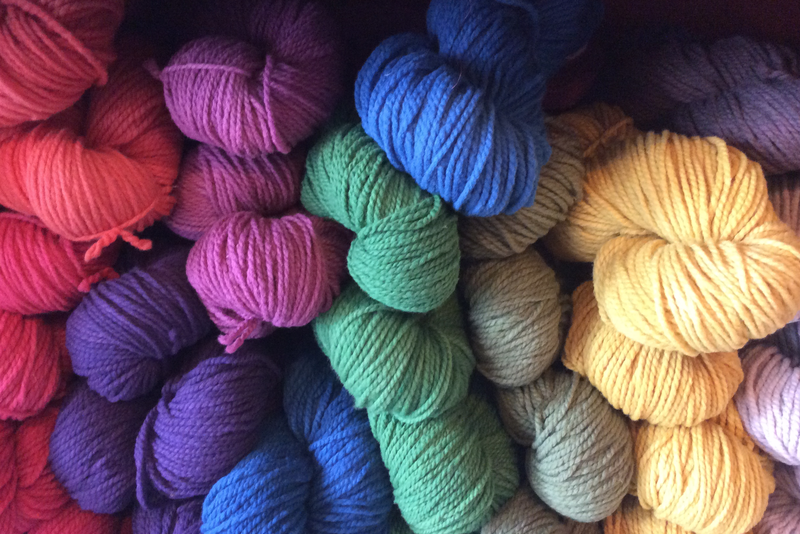 This year at Love.Yarn.Shop. we’ll be making Ann G.’s simple gnome ornaments from 1-2, so grab some friends and come on down! We’ll have cider and cookies for a little mid-afternoon refreshment. The festivities begin at 10:00 with the Methodist Church Bazaar and Santa Claus at the Heritage Center. Find out about all the events at Christmas in Bethlehem. 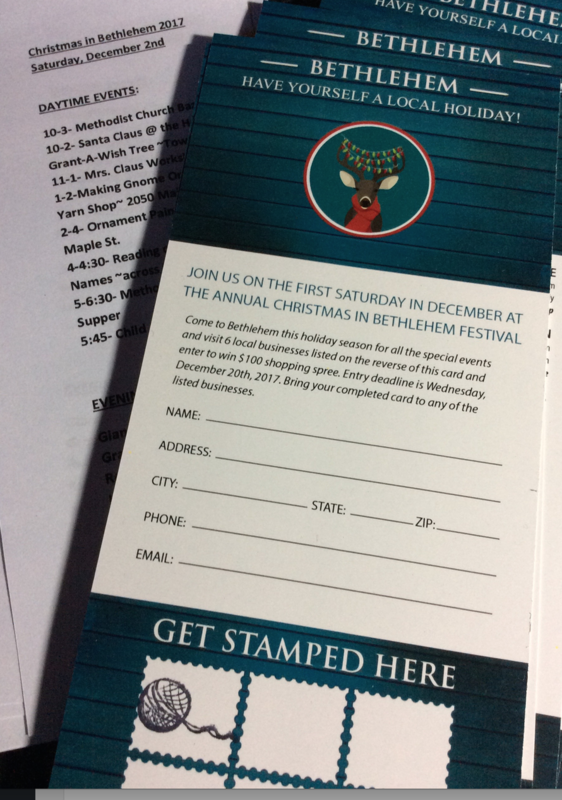 This year in Bethlehem, we are offering for the first time special discounts at local shops, so make sure to pick up your card at local businesses and get it stamped. The entry deadline is Wednesday, December 20th, and with 6 stamps from participating shops and restaurants, you could win a $100 shopping spree. Fidget Lap Blankets and Twiddle Muffs! 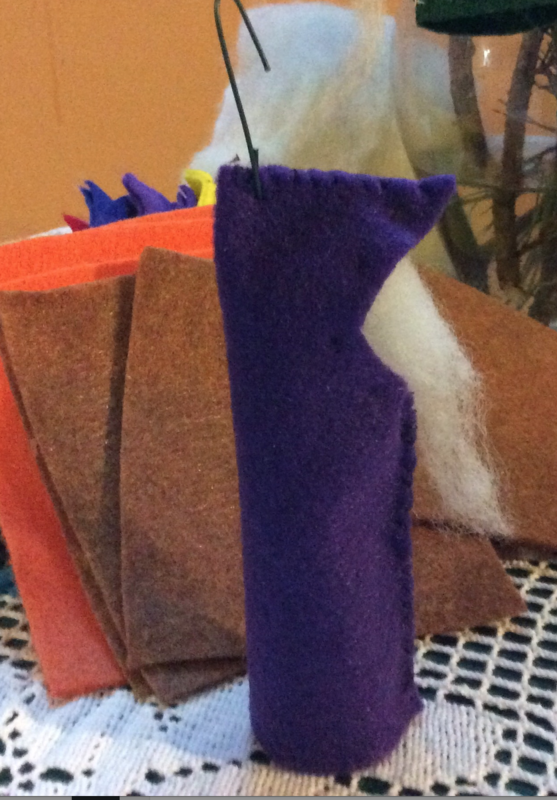 Fidget lap blankets and Twiddle Muffs are both terms for sensory blankets for dementia patients. Often patients’ hands and fingers are continually in motion. According to Brenda Avadian, the person with dementia often has a desire to be useful, to “fix things,” and keep busy. Many people with dementia or Alzheimer’s Disease are disconnected from the world around them. Sensory stimulation can be in many forms, from objects not normally found in their environment, like seashells, to hand massages, or trips outdoors. The stimulation can reconnect the person to a memory or to the present and can lead to smiles, words, and eye contact. The sensory blankets provide soft textures for the person to stroke, with buttons, strings, and braids, that may evoke pleasant memories and give the hands something to work. Blankets can be quilted, crocheted, or knit. Here is the pattern I use for knitting at Fidget Muff. You can leave it unseamed for a flat blanket or seam it for a muff. Cast on 30 stitches with #17 needle and bulky yarn. Switch to another yarn every 3 rows, leaving yarn ends with four inches to make fringe. 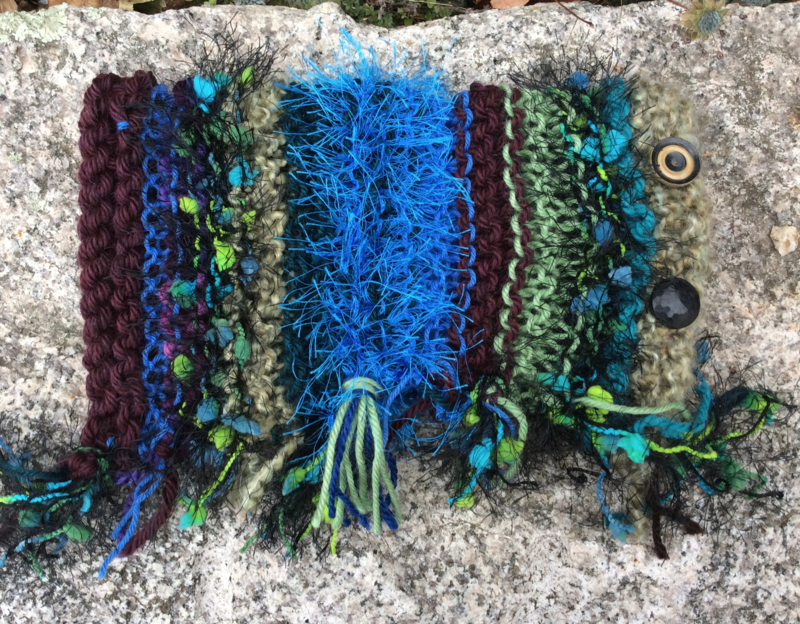 Alternate weights and colors to make an interesting texture; incorporate bobbles or eyelash yarn, sock yarn, ribbon yarn, etc. Make muff 10 inches long. (If making a flat blanket, you might want to make it 12-14 inches long.) Bind off. Tie the ends and make extra fringe. Fold in half and seam. Sew on buttons, i-cords, crocheted flowers, or any item to fidget. We’ll be working on fidget muffs and fun hats this Sunday from 1-3 at the shop. Come in you can! Many of us love to knit with a combination of alpaca and wool–it certainly is my favorite–but finding an American combination has been challenging, especially hand-dyed. The Alpaca Yarn Company has just launched “Symmetry”, a 50% baby alpaca, 50% fine wool, in sport weight, kettle-dyed in 18 beautiful colors. This is a perfect yarn for garments that are soft to the skin and warm to wear. You have to see it to appreciate the colors, with deep and pastels partnered for those two color projects. Join us on Friday the 10th from 5-7 to check it out. In addition to promoting wool, Francis is adamant about processing wool without the use of harsh chemicals and maintaining the lanolin and natural characteristics of the fiber. He believes the current “super wash” processing of wool, which uses chlorine gas to strip the outer fibers, then Hercosett 125, a plastic, to coat the fiber, leaves a product that is no longer wool at all. Next time you are knitting with super washed wool, have a good feel of it. You too will wonder about the content of it. Merino wool, which is naturally fire resistant and water repellent, can be machine washed in cool water and hung to dry. It can’t be thrown in the dryer, like super wash, but you can feel good about the product you are wearing. 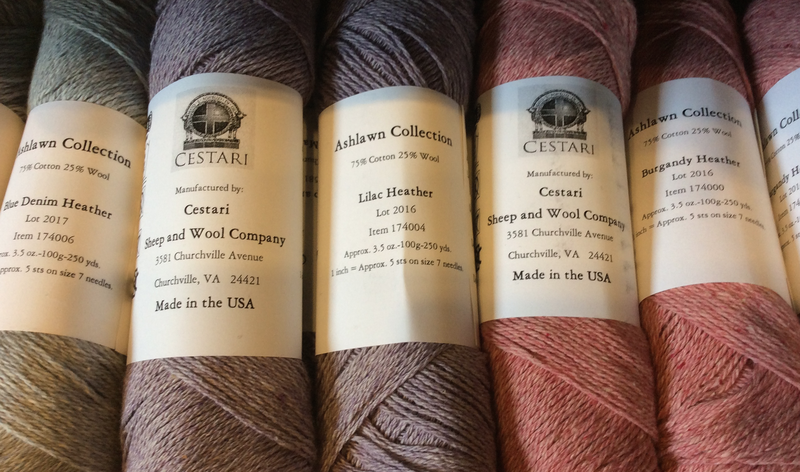 Cestari wool and local cotton is hand dyed or kettle dyed. 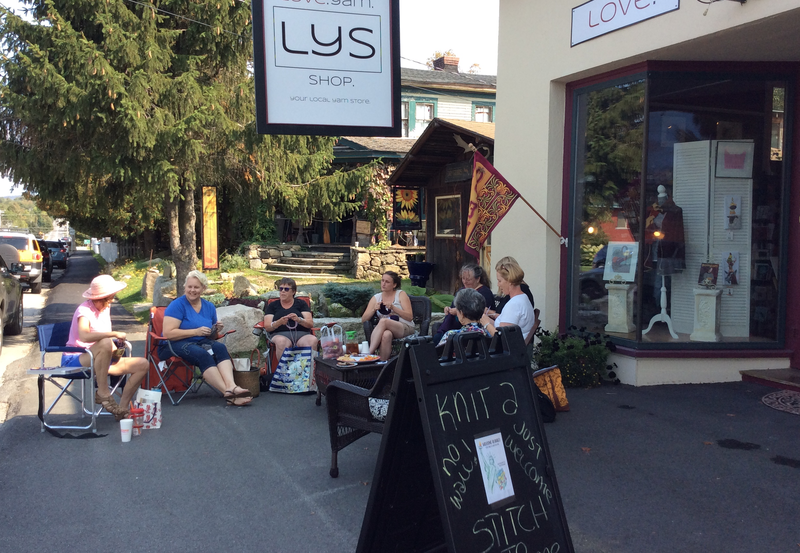 At the Yarn Tasting on Friday, October 13th from 5-7, we knit/crocheted with their Mt. Vernon line of 100% Merino, Old Dominion Collection of 100% Virginian cotton, the Traditional Collection of 100% wool, and Ash Lawn Collection of 75% cotton, 25% wool. The Mt. Vernon made a lovely tonal fabric, perfect for sweaters. The Traditional Collection still has the smell of the sheep and the grease of the lanolin, another great choice for a sweater. I’m using the Ash Lawn for a baby blanket, with it’s cotton/wool easy wash fiber and gentle pastels. The cotton will make great dishcloths or cotton tops. Come check them out! This is a big weekend in Bethlehem. The Change Agent Film Festival, starting Friday, September 15, and going through to Sunday, the 17th, features Citizen Jane, Dolores, Ada for Mayor, and Waking the Sleeping Giant, all films chronicling people who have brought about significant changes to make their communities a better place. 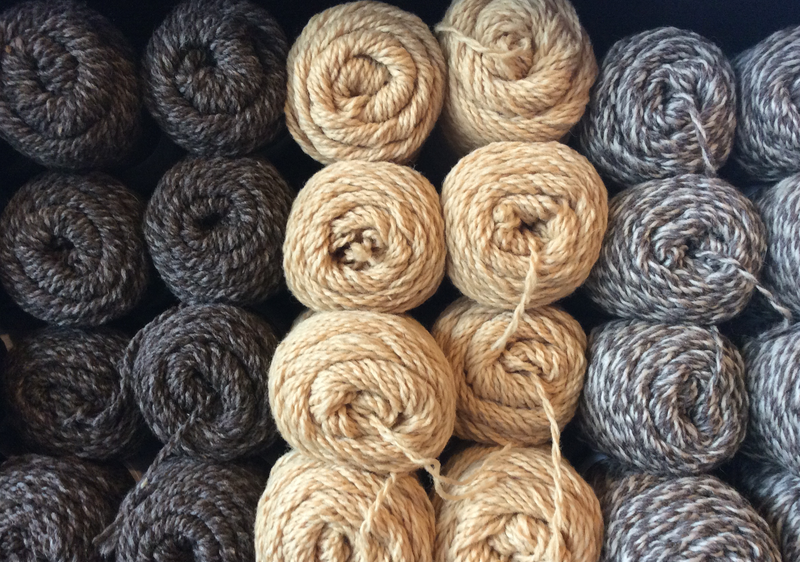 Love.Yarn.Shop. will be on the sidewalk knitting on Sunday from 1-3, with the beginning of a lap blanket for the Welcome Blanket project. Smart Museum of Art is calling for blankets which they will put together to equal the length of the proposed “Wall” on the border with Mexico. After the display, these blankets will be distributed to agencies that work with new refugees and immigration families. Come by and we’ll show you how to knit and you can knit a few stitches, a row, or even several rows, knowing this will go to welcome someone into the country you believe in.